For use on hardwoods, softwoods, and wood composites indoors and outdoors. Requires only 20-30 minutes of clamp time, and is fully cured in 24 hours. Dries to a natural wood colour. Non-toxic, water-based, solvent free polyvinyl acetate (PVA). 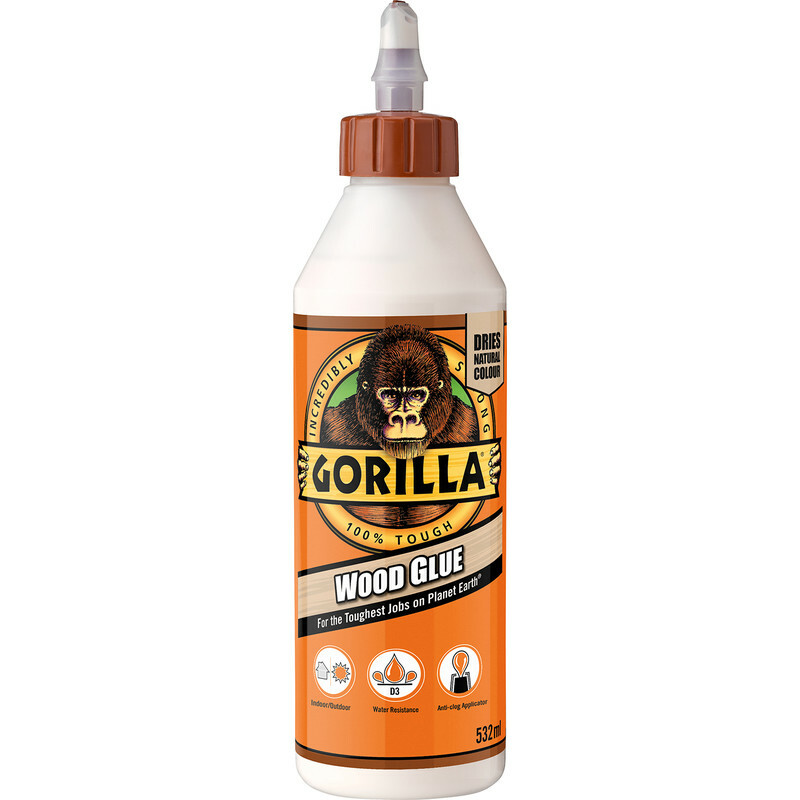 Gorilla Wood Glue 532ml is rated 4.9 out of 5 by 26. Rated 4 out of 5 by Richard41 from Handysize and the dispenser nozzle works a treat. I brought this to stick some wood and that is exactly what it done. Rated 5 out of 5 by Bofy from Good general purpose wood glue I prefer this to the other general purpose PVA-based wood glues. It sticks well, with a short clamp time and the dispenser works well as is less prone to clogging than other brands. Reasonable value in the larger size. Rated 5 out of 5 by Mr Tall from Quick drying and very strong Normally use PVA, but this outperforms. Rated 5 out of 5 by BW_TW from Great strength Used this to glue a sheared sitting chair leg. I was really nervous it would not hold but it has done the job perfectly and cleanly.